A car versus bicycle collision leads to a full knee replacement for a 61-year-old woman who had to endure multiple surgeries to repair her injury. The team of Attorneys at ChasenBoscolo were entrusted by the Plaintiff to convey her traumatic incident and the lasting effects to the court. The team of attorneys handling this case included Benjamin Boscolo, Jonathan Breeding and Barry Chasen. The case was tried in the Circuit Court of Arlington County, Virginia. Unfortunately, liability was not admitted in this case and the defendant alleged contributory negligence. This was bad news for the ChasenBoscolo team, since it meant that if the jury found the Plaintiff to be even 1% responsible for the collision, she would be barred from recovery. Thus, the team needed an edge in the courtroom. Following the recommendation of Attorney Chasen, to use DK Global to provide animations, the trial team sought out DK Global's expertise. According to expert’s details, the Defendant carelessly hit Attorney Boscolo’s client while making an illegal right turn into the cyclist, severely damaging her knee. On the day of the incident, surgery was done to place an external fixator on her leg to keep the bone in place. Eighteen days later, she underwent an open reduction and internal fixation (ORIF) procedure that her doctors hoped would fix the problem. However, she then had to go through three additional medical operations, ultimately leading to the full knee replacement. The medical animations created by DK Global showed the extensive amount of procedures in chronological order, showcased the extent of the damage, and depicted the failed attempts to fix the sustained fracture. DK Global’s animations walked the viewers step by step with written captions, as a way to bridge the audience visually to the written medical reports. Given the complexity of the case and the fact that the Defense made an offer that did not meet the attorney’s desired amount for his client, lead litigator Benjamin Boscolo, strategically worked with the animation team at DK Global to produce the powerful presentation. The trial team used the animation in the Opening Statement, during the direct examination of the treating orthopedic surgeon, and again in Summation. 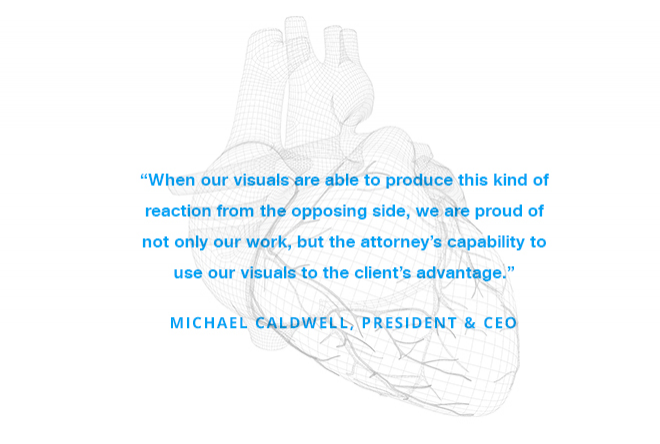 There is no doubt that the animation helped hold the jury’s attention like no other demonstrative evidence that the ChasenBoscolo firm had ever used. After three days of trial, the jury awarded the client $800,000.00. Attorney Boscolo knew that his client would have life altering effects on her health after the collision; along with a long list of surgical procedures, follow ups, and therapy. The substantial verdict gave the Plaintiff the financial ease she needed to be able to prioritize her health. Months before trial, the ChasenBoscolo team reviewed the animation with their client’s surgeon. The surgeon ratified that it fairly and accurately depicted the procedures he did. Additionally, he said if anything, the animation was less graphic than the procedures. When a patient’s leg is manipulated under anesthesia, it is exceedingly painful and is always accompanied by intense screaming out in pain. He added, that the mallet work used in the total knee replacement is much more violent in reality. ChasenBoscolo is an East Coast law firm with over 30 years of experience who pride themselves in taking care of their clients; whether it’s an automobile collision or a workers’ compensation claim case, personal injury is their specialty. The attorneys at ChasenBoscolo make certain that when they give their word, people can “take it to the bank.” This case was no different. Our team at DK Global is happy to have helped the ChasenBoscolo trial team in their pursuit of justice for their client, and we look forward to continuing working alongside ChasenBoscolo in their mission to fight for the underdog.